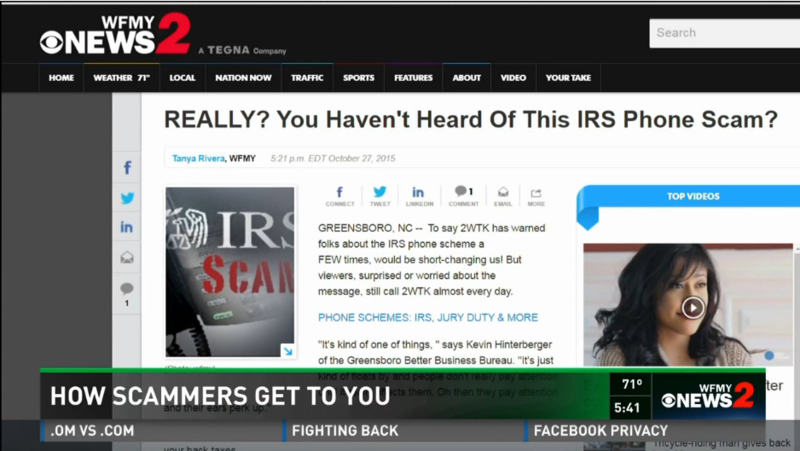 Click here to see my latest WFMY News 2 Interview about scammers. It is tax time. It is also scam week here at WFMY and those two go hand in hand. Did you know that according to the Federal Trade Commission Consumer Sentinel Network that reports fraud among multiple agencies, in 2015, 45% of fraud was in the form of tax or wage related fraud nationwide. My point is that these calls happen regularly. She called my cell phone. These scams are more and more popular and today and you need to arm yourself and your family members who could become targets with the necessary precautions to insure you don’t fall victim. How Much Do Scams Happen? According to the federal trade commission, reported scams are on the rise. Look at the chart below showing how many complaints are received each year. You can see that in 2001 only 325 thousand complaints were reported and just 15 years later over 3 million complaints were reported. The activity is on the rise and the reason has to be that these people are having some success scamming people out of their hard earned money. The reported numbers alone show that over $500 million was taken from Americans just this past year. The numbers are very high so don’t think it couldn’t happen to you or someone you love. -Statistically speaking, a scammer will be more likely to target you in your 50s or 60s. -Typically, a scammer is most likely to contact you by phone. -The scam involves some sort of tax or wage scam as we saw before in the data. The scammer will be much more likely to have you wire money from your bank account to theirs. This is almost the same as mailing cash and you better believe that if you have wired some money to someone they very well could be a fraud. A neat resource is the Better Business Bureau. While they do not have the same amount of data as the FTC as their data relies on people instead of enforcement agencies, it is still relevant. Just look at the ones reported for our area. For that same area, the scams have more detailed information. The chart below shows the top scams reported on that map sorted by money reported lost. Again, not everyone will report but this is a great way to dig in and get further information on some of the popular scams in the area so you can be more informed if you get a call, email or letter from a scammer. When you click on view, you will see even more detailed information on the scam and what the caller said. This is a great way to stay in the know on the latest scams that could be happening in your area. The Federal Trade Commission gives a great list of tips to avoid fraud. I have a link to the article here. No matter what happens, never ever give your information over the phone to someone who calls you unsolicited. Ask them if you may call them back. Once you hang up, go look up the number for the company yourself and call the company and ask them to see if there is any record of a call that should have been made. Email is another great resource for scammers. Many times it comes in the form of someone you trust who has had their email hacked. Be very careful. If a friend sends you a file under the Google Documents, this is a great scam. It requires you to go put in your user name and password for google and then they have access to your account. Be very wary especially from friends who send you something that sounds out of character. I have even had clients email get hacked and ask if I would wire money. While I knew that was out of character for the client and called immediately, it was very real looking in appearance. Be mindful. Not only for yourself but for others who are important to you who may be more likely to fall for a scam. Even the most official sounding phone calls or emails can be a clever disguise for scammers. I am many times surprised by their creativity and abilities.